One serving mutton, the other chicken pie. And I, caught in a quandary between the two. Mine eyes doth gaze upon my calendar. To change his invitation to July 26. A whining maggot-pie, he called me. The nerve of that canker-blossom! And so, I am resolved to choose one or the other. Allow me to think whilst I eat this gingersnap. And this one as well. And hello! Is that custard? I'faith! Is that calf tongue yonder? And boiled partridges? And stewed trout? And anteater face with parsnip gravy? And cat stomach sausage? With quail's blood sauce? And oysters on wild dingo brains? And candied lizard on a bed of shaved oxen sinus? Alack! I am stuffed. And I must go nap. Fat Shakespeare, what is this? I asked you for an etiquette piece. And all you did was talk about some conflicting dinner party invitations and then eat everything in my refrigerator. Not now, mine ladye. A food coma hath taken me. And I have a touch of the runs. Pray tell, have you any extra Charmin? 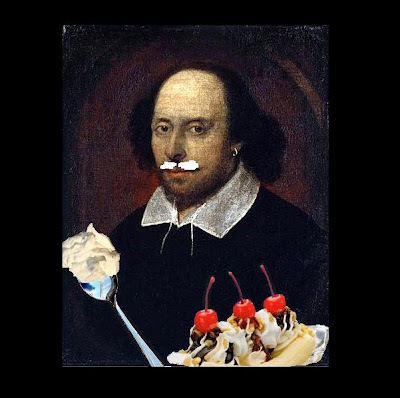 If your fridge was stocked with items like anteater face and cat stomach, I'd argue that Fat Shakespeare did you a service by cleaning it out. Verily, good ladye! I did the mammering wench a favor by cleaning out her cooling pantry. I even finished off her frozen water rectangles. Uh, Jen, he didn't find that "cat stomach sausage" in the refrigerator. I didn't want to tell him, but he was eating out of the litter box. And I'm pretty sure that "anteater face" was my entire bottle of shampoo. Hmm. Well, that changes matters somewhat. At least you can put off emptying the litter box for a while now. i think i'm going to retch. Stay, peach! Prithee retch not here. I have a very weak stomach. If you retch, I shall retch. And that would create quite a mess indeed. I Am a Guppy. Deal With It. Have Thee an Etiquette Query...?